It's just so lovely to read a book and be able to say it made me laugh out loud. I love it when that happens! And Paul Beavis is responsible for it. This clever, dry, talented author/illustrator has created a story both adults and kids will find enormously funny and rewarding--not only for its fabulousness, but for the fact that it doesn't follow any kind of monster stereotype. When Mrs Mo opens the door to a monster one day, she's a tad miffed when he invites himself inside (without even a 'hello'--how rude) and proceeds to munch, crunch and chew his way through the house. There's no reasoning with this horrid creature--no matter how calmly Mrs Mo tries to talk him round, there is no stopping his naughty escapading. It's because munching, crunching and chewing is all he knows. It's all he can do. He knows no better. 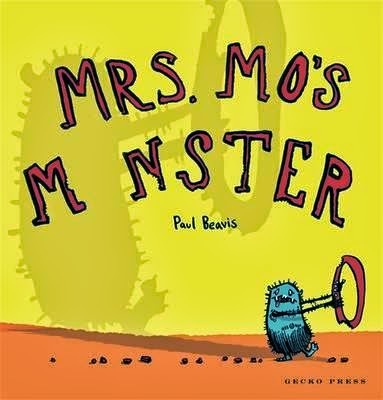 Can Mrs Mo turn him around into a polite, well-rounded, accomplished monster? This extremely loose take on Trading Places is hilarity personified, not only in the totally kid-speak text but in the slick, bright, über cool illustrations, the unlikely ensuing friendship, and the absolutely brilliant, guffaw-worthy ending. Check your local bookshop now. Paul Beavis. Remember the name.